Since the various Google Panda updates hit, a greater importance has been placed on on-site SEO. Sites with bad internal link structures were smacked, that is sites which link to the same pieces of content with different URLs, sites with large amounts of “thin” content such as tag archives, member profile pages, search result pages and so on. I had to do a lot of reading about this to try and improve our onsite SEO for WPLift. One thing I found out was that your site’s internal linking structure is very important – sites that did well in the updates grouped together similar content in “hubs” which helps Google know which content is related, its also good from a user’s point of view as it provides them with more content they may be interested in. For example rather than having a menu or footer which links to every section on your site, you would split the site into main sections and have a “hub” page for each section which then links out to topics on that subject, these pages then all link back to the “hub” page. This sort of structure should be created by hand so you can ensure everything is tightly related so today Im looking at a plugin that will help you do just that. No Sweat Internal links ( excuse the cheesey landing page ) is a plugin which allows you to create different types of internal linking structures and will inject the links into your posts or pages and allow you to change them as you like from a central page – a lot easier than manually adding links to each page. Because it allows you to manage your links from the plugin page you can also experiment with different linking structures quite easily. Once you have activated the plugin you will see a new menu item added named “No Sweat Internal Links”, if you visit this you can enter your license key and choose two introductory texts. Introductory texts are what will go before your link is added, so for this I chose “Further Reading on This Topic” and “Check out More about This Topic”. You then have a choice of placements for where the link will be injected, choose from Top, Bottom or Shortcode placement. Finally on this page you can choose which post types you would like to show links on. Now you can visit “New Structure” and being creating your first one. On this page you will see at the top, 4 different linking structures : Hub, Ring, Web and Star. You will need to choose one of these so lets take a look at what each one and what you can do with it. The Hub structure is probably the simplest but most powerful one, it is a series of pages ( or posts, or other post type but I will refer to it as pages for this guide ) which all link back to one main page. Examples of this would be a page that you want to drive traffic to or rank highly in the search results as it is your “money page” such as a product signup page or an affiliate review etc. If you would like to create a Hub structure, on the “New Structure” page, tick the “Hub” box and name this structure something relevant so you can identify it. Then you can choose the number of “Nodes” which are pages pointing to your main target page. 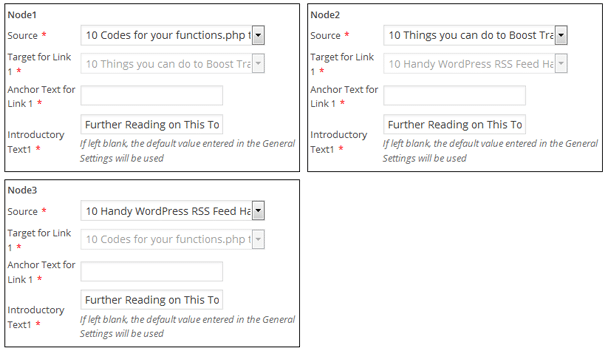 I chose 3 nodes and then you can then choose which main page you want your nodes to be linking to, For this example I chose our Free WordPress Themes of the Year post which is your “Target”, you then choose a “source” for each node which is the post that will be linking to it. For each one I chose a relevent post on the same topic. 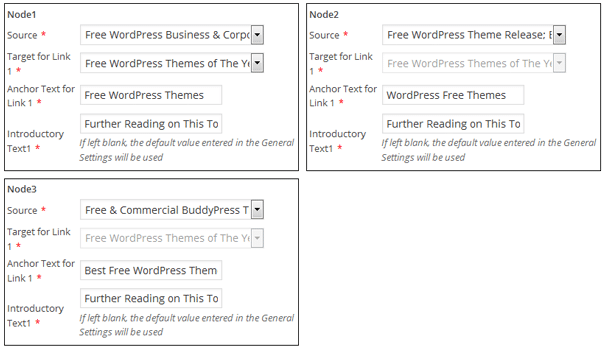 You can then enter anchor text for each node – you can keep this the same or as I did, enter a slight variant for each one, I chose “Free WordPress Themes” , “WordPress Free Themes” and “Best Free WordPress Themes”. If you then visit one of your “node” pages you will see the link has been added where you chose to place it, linking back to your “Target” page. The Ring structure is also quite simple and is designed to get people to stay on your site by providing a link to another page on the same topic, sort of like how the Next and Previous post buttons work in your theme but you can choose topics which are closely related which increases the chance of the reader being interested. You can choose the number of nodes again and pick a “source” post which will then populate the “Target” for the next node, leading around in a ring pattern. The web structure is a little more complex and is basically a combination of the two previous structres – each page will have two links on it, one pointing to a main target page like the Hub structure and also will point to another related page like the ring structure. 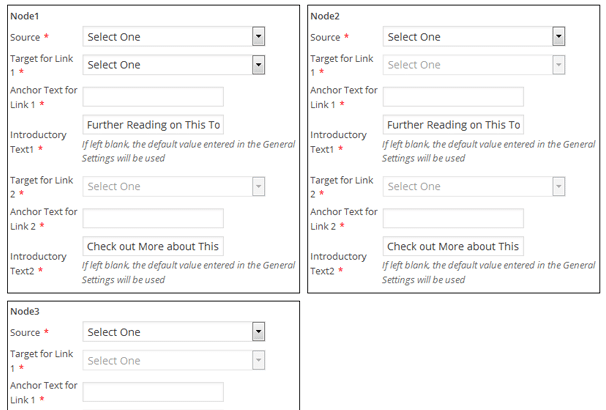 Setup for the Web structure, note that each node will link to 2 target pages, the main hub page and the next ring page. To use this structure you will need a minimum of 4 nodes and will need to define two links for each one, picking your first source will populate the next node and so on. 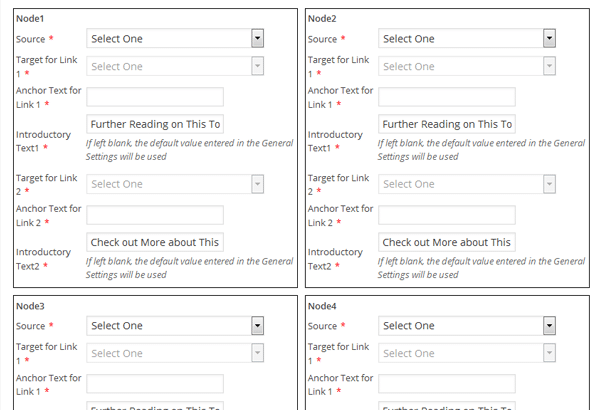 Internal linking is definitely something you should be doing on your site to provide more weight to the pages you choose rather than just relying on using WordPress categories, archives, tags and whatever navigation structure your theme uses. By carefully planning your linking structure and using a plugin like this you can direct “link juice” to the pages you wish to target which if you are competing for a certain search engine ranking may just give you the edge over your competition. You can grab the plugin for $17 here. How does this plugin behave resource wise? I’ve seen a few other internal linking plugins like this one and they all tend to be quite heavy on the old resource front. Thats a good point, this plugin should be fine as you are inputting the links by hand which are then stored in the DB. The ones which tend to struggle are the automated “related post” type plugins. As a webmaster, you will be defining the siloes yourself, so they are not generated dynamically upon page load. Thus, the impact the plugin has is very light, as it just has to get one or two pre-defined linkes from the DB, not do some complex “calculations” to try to get similar posts on-the-fly. Also, this gives you much more control over what will be linked from each posts, instead of leaving it to an algorithm that may ot may not get it right, and show some irrelevant “related posts”. Great minds think alike (sometimes !). I have completed reading a variety of books on current “white hat” SEO techniques, including the “classic”… “SEO for DUMMIES”…written by Bruce Clay, in which he goes into rather excruciating detail about how to build SILOS. He also makes it clear that working with STATIC pages is MUCH preferred to DYNAMICALLY generated pages from a CMS like wordpress. I began my investigation into various possible solutions for WP and not many plugins exist in the repository, and most are not rated favorably. The plugin you referenced seems to have some potential, but I also am concerned about using a “plugin” for this type of work as I worry what will happen if the plugin stops being supported for future updated versions of wordpress. If that were to happen, and the plugin stopped functioning properly, it could be CATASTROPHIC if the plugin were to generate these links “dynamically”, but it appears as you say that they are not. I also read somewhere that the drop down menus used in WP themes are a DRAIN of the “LINK JUICE” created by the SILOS in your site, if the home page is to be the MAIN SEO page, as the links from the drop down menu are all pointing back to the pages underneath it. 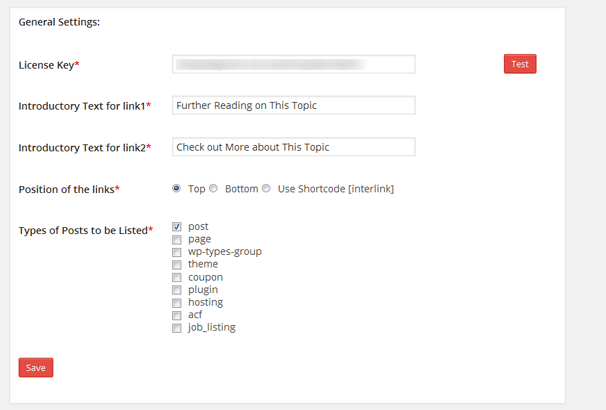 “Most WordPress Themes cannot be used for a Silo based web site as they automatically include linkages which will BREAK any attempts at creating Keyword Themed Silos. Links to category, tag, author and date archives dilute your precious internal link juice amongst non-relevant pages. Sidebar widgets such as Recent Posts widget will THWART your attempts to create silos as they have no context at all in relation to your post content.” etc…. Again, this might be a possible solution to the silo dilemma, BUT only if the theme is going to be supported for the “indefinite” future. It would also be catastrophic to invest in using this theme only to find out in a year they went broke and the theme is no longer supported. I realize you offer suggested solutions based on “affiliate” marketing, but in this instance, I’d appreciate your candid and forthright insight. I’m not a tekkie, and have only just recently begun using WP. Thankyou for whatever help you can provide. Also, if possible, please email me your reply, as I may not see it otherwise. Pardon me if I missed it somewhere but the “You can grab the plugin for $17 here.” link goes to 37 dollars. Is this old info maybe?